The M-30 STD Mini-Baler makes a bale of corrugated cardboard box/cartons weighing up to 140 pounds. It will also produce a bale of clothing adjustable between 80 pounds and 175 pounds. Recycling materials such as stretch wrap, shrink wrap and other plastic films are easily baled into 200 pound bales. Compact a mountain of material into a neat, dense, marketable bale measuring 24 inches wide by 30 inches long and 25 inches high. 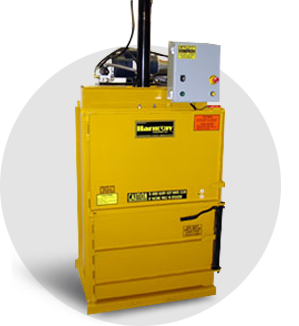 With 4 tie slots, the M-30 STD Mini-Baler makes solid, uniform bales of clothing, rag stock, plastic stretch film, beverage bottles, office paper, or cardboard. The M-30 STD's low height and small space requirements make it possible to locate it virtually anywhere in your facility where you want to reduce labor and save space. 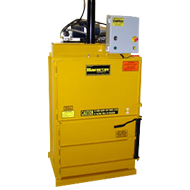 This uniquely affordable baler allows businesses with even small quantities of material an opportunity to save by recycling or simply compacting loose material before disposal.